Cars and trucks account for nearly one-fifth of all emissions in the United States. In fact, each gallon of gas emits nearly 20 pounds of carbon dioxide and other greenhouse gases. This makes them a natural target for municipal level action, since cities have little control over power plants and other sources of greenhouse gas emissions. Cleaner fuels and more fuel-efficient vehicles are certainly helping mitigate the problem, but the average vehicle stays on the road for more than a decade and standard gas models remain the most popular. Cities are being forced to take different approaches to meet their emissions targets—including changes to transportation infrastructure. In this article, we will look at how smart traffic signals can help cities meet their emissions targets, while simultaneously improving travel—a win-win for everyone. Carnegie Mellon launched the Scalable Urban TRAffic Control (SURTRAC) project in 2012 as part of its Traffic21 research initiative. Over a nine-month period, nine traffic signals in Pittsburgh were outfitted with technology that collaboratively adapted in real-time to actual traffic conditions, rather than using standard (but arbitrary) preset timers. The results were remarkable by any measure: Drivers experienced a 40 percent reduction in vehicle wait time and a 26 percent reduction in travel time. Simultaneously, the researchers found that the technology reduced vehicle emissions by about one-fifth (21 percent) by reducing the amount of time that vehicles were idling on the road. 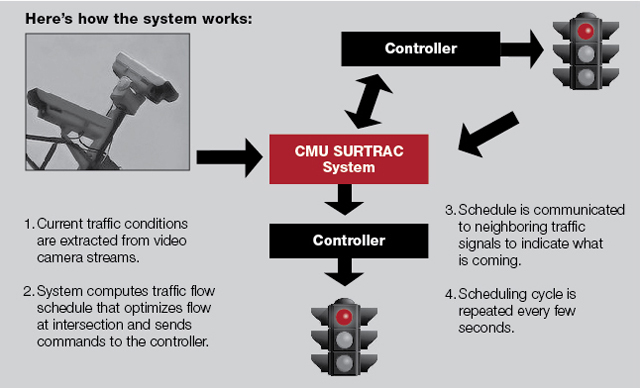 The SURTRAC system uses a series of video cameras to provide real-time traffic flow information that is analyzed to determine the optimal flow at a given intersection. The schedule is shared with neighboring traffic signals to indicate what’s coming ahead. The cycle repeats every few seconds to maintain optimal traffic flow. Many cities currently use induction loops that are embedded in asphalt. These sensors can detect any vehicles waiting on a side road and trigger green signals across a major artery. The problem is that these sensors cannot differentiate a single vehicle from a traffic jam—much less cyclists, pedestrians or buses. Download our checklist of strategies to help your city meet its emissions targets. The SURTRAC system is only one example of how smart traffic control systems can help reduce traffic congestion and reduce greenhouse gas emissions. 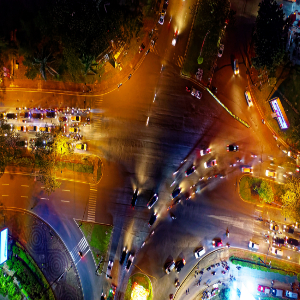 Using sensors, processors and machine learning software, these smart solutions can determine traffic density and composition to make more informed signal decisions. In the future, smart signals could interface with connected vehicle technologies to warn cars when lights are about to turn red, or to enable them to find the most efficient routes given patterns of red and green lights. Traffic lights could even become a relic of the past if and when all vehicles are required to connect to traffic infrastructure. The problem is that many of these technologies remain in a pilot stage, and the costs for commercial solutions can be extremely high. For example, overhauling a complete network of signals could easily run into the tens of millions of dollars. There’s also the added cost of integration, training and maintenance. A good first step is introducing connectivity to your existing traffic signals, generating reliable traffic flow data and remotely updating the signal timers. That way, you can realize the immediate benefits of signal optimization without the high upfront cost of complexity, while still building connectivity for the future. Don’t forget to download our checklist of strategies to help meet emissions goals. Our Glance Connected Traffic Cabinet System works with your existing hardware to add a new level of connectivity. By installing a small device in the traffic cabinet, you can remotely access the traffic signal and gain a new level of control. The traffic signal is seamlessly integrated into the wider Glance software system, which converts raw data into actionable reports. 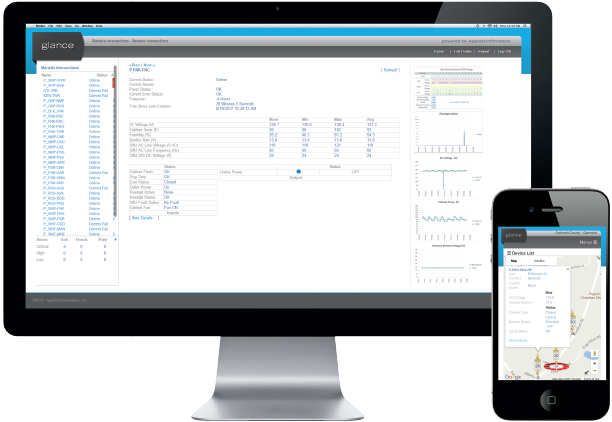 You can generate easy-to-understand reports based on real traffic data and wirelessly update timing plans for your traffic signals. If there’s a power failure, communications failure or other equipment failure, you can instantly send text or email alerts to technicians. And because Glance configures itself automatically, there’s no costly and time-consuming manual configuration necessary. Smart traffic signals are just one way that cities can meet their emissions goals. Bicycle commuting is another way to help reach emission goals through transportation changes. While the federal Bicycle Commuter Tax Benefit was phased out in 2018, cities can encourage bicycle commuting by strategically planning out bike lanes and paved trails to key locations. More recently, e-bikes and e-scooters have become increasingly popular alternative modes of transportation. E-bikes make it easier to commute long distances, while e-scooters provide a valuable last-mile transportation solution that works in conjunction with public transportation. Our Glance Smart City Supervisory System can provide traffic analytics to help make informed decisions about where bike lanes could be least intrusive to motor vehicle traffic. In addition, our Travel Safely App can integrate with smart city technologies to alert cyclists of unsafe drivers. Many cities have adopted climate goals over the past couple of years. Because vehicles are a primary source of emissions, they’re a natural target for cities looking to reach or exceed those goals. Smart traffic signals represent one of the most cost-effective ways to reduce traffic pollution—and improve the daily lives of the citizens. Carnegie Mellon’s pilot program demonstrated that smart traffic signals could reduce emissions by upwards of 20 percent, while greatly improving congestion and commute times for citizens. While these solutions are still in an early stage of development, Glance enables cities to easily and cost-effectively introduce connectivity to start making positive changes today. Use this checklist as a starting point when developing municipal strategies to meet emissions targets.